This product requires the base game 99 Spirits. 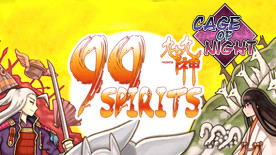 99 Spirits - Cage of Night stars fan-favorites Saki and Komiya, and adds brand new characters. A story of tragic love and foxes’ games told in visual novel style, the Cage of Night is set during the events of 99 Spirits storyline and is set in a darker mood than the main story. Developer Symposium with commentary by TORaIKI, 99 Spirits' creators. Includes both an English and Japanese version of Cage of Night. © 2014 Fruitbat Factory, Inc. All rights reserved. This content requires the base game 99 Spirits on Steam in order to play.